Our Service Department is a team of talented professionals devoted to our mission of providing prompt and courteous service to our customers. We work directly with owners of a wide variety of commercial, manufacturing, technical and professional businesses, as well as providing electrical services for many general contractors. We also provide electrical service work for residential customers: from adding new circuits to upgrading or replacing the service panel to troubleshooting and repair of problem circuits. Our Service Coordinators are available from 7AM to 4:30PM Monday through Friday to take requests for electrical service, schedule appointments and dispatch technicians. After hours emergency service is available 24/7 by leaving a voice mail urgent message, which immediately pages the on-duty personnel who will promptly return the call. We have a large fleet of service vans equipped for small projects, electrical installations, troubleshooting and repairs. 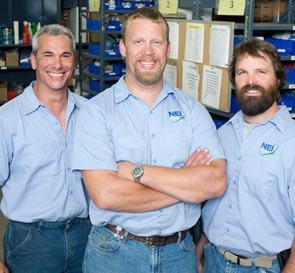 Our technicians will promptly repair your electrical systems whenever and wherever the need arises. Pro-active scheduling of preventive maintenance can eliminate expensive emergency repairs and facility shutdowns due to electrical failure. 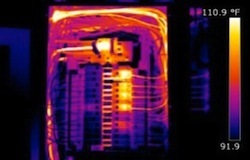 NEI Electric uses thermographic imaging, also known as infrared scanning, to scan electrical equipment during normal operations, documenting and recording hot spots which could lead to electrical equipment failure and unscheduled shutdowns. Call us or complete our online request form today.